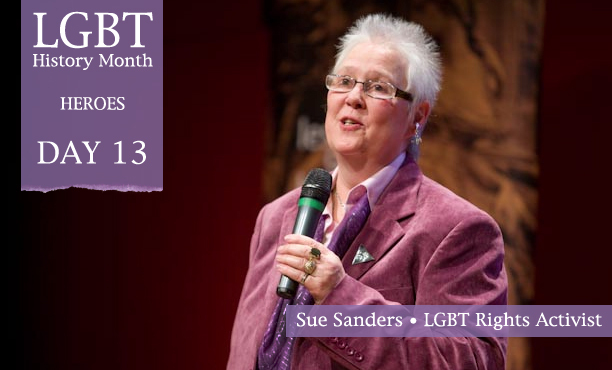 Sue Sanders is a leading LGBT rights activist, and one of the founders of UK LGBT History Month. For over thirty years she has worked to challenge oppression in the public and voluntary sectors. She is an author of poetry, short stories as well as many articles and brochures on feminist issues, education and homophobia who regularly appears on TV and radio programmes dealing with equality and LGBT issues and is a keynote speaker and workshop leader in many conferences dealing with diversity, homophobia and LGBT issues. Sanders is a member of the LGBT Advisory Group to the Metropolitan Police, an independent advisor to London Criminal Justice Board, a member of the National Union of Teachers LGBT working party, the current vice-chair of the Southwark anti Homophobic Forum (which she joined in 1997) and a consultant to the Crown Prosecution Services, helping them produce national policy on prosecuting homophobic crime effectively. Since 1984, Sanders has worked as a management consultant and trainer for the public and voluntary sector. In 1996, she co-founded Chrysalis with Paul Patrick, which is a consultancy that delivers training around equal opportunity issues – particularly anti-heterosexism. In 2000, she became the co-chair of Schools Out, a group working for the equality of LGBT people in the education system, which she co-founded in 1984. In 2004, she instituted the first ever LGBT History Month in the UK which, with the help of the Schools Out committee members, was launched in December 2004 at Tate Modern. In 2007, Sanders received the Clio’s Silver Cup Award from the International Lesbian and Gay Cultural Network for outstanding achievements in documenting and disseminating information about LGBT History and in July 2009 she was awarded the first Derek Oyston Award in recognition of her lifetime’s campaigning for LGBT rights at the celebration of the 30th anniversary of the Gay and Lesbian Humanist Association (GALHA) and the 40th anniversary of the Campaign for Homosexual Equality (CHE).